Plot: A family live in perpetual silence for fear any sound could beckon terrifying monsters. A simply brilliant piece of cinematic thrills, a film that uses sound as a weapon of mass destruction on your anxiety. A beautiful and harrowing film in equal measure that will have you shivering at the sound of your own footsteps. 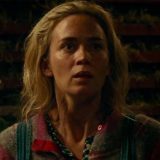 The premise for A Quiet Place is the kind of high concept idea that Hollywood used to dine out on with big budget blockbusters. The kind you can jot down on a napkin while being wined and dined by executive producers. It’s simple, the world now lives in a state of silence because any noise made alerts ferocious creatures that kill with ruthless efficiency. Simple idea, but how do you then make that last for a whole film as opposed to an episode of The Twilight Zone? The opening gambit alone is enough to leave your breathless, a simple child’s toy proves in this quiet place silence is not only golden, it’s essential. John Krasinski, acting as actor, co-writer and director, conjures a film of nail-biting brilliance. 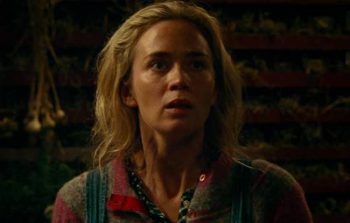 So powerful is the silence of A Quiet Place that any sound you make during or after the credits roll feels like an explosion, echoing throughout your head and having you wait with bated breath as to what might come next. Rather than giving us an insight into what brought these monsters, it’s never stated if they are alien, supernatural, nature or science, we focus on the human element. And in doing so the film hooks you in. On paper this is a straight up horror, and a terrifyingly effective one, but it refuses to be just that. Instead, A Quiet Place is a familial drama, an exercise in grief, and perhaps more than anything an essay on parenthood. It feels all the more powerful that our central couple are indeed an off-screen family themselves. The chemistry between Krasinski and his wife Emily Blunt is perfect. But it is in the nuances of their interactions with their onscreen children that really resonate. Anyone who has ever tried to put a baby to bed will feel a sense of haunting deja vu of creeping around as the baby drifts off to sleep, aware that the slightest noise will wake it, bringing on a monster to chill you to the very core, not to mention leaving you sleepless. There is very little story to talk about, rather a concept, character drama and set pieces so brilliantly executed it is hard to think of a film as nerve shredding in recent memory. To begin with Krasinski goes the Jaws route, only showing us the creatures fleetingly. Often this tactic in film leads to the big reveal being anticlimactic, but in this case the creatures manage to somehow be as terrifying in reality as they were in your head. That they owe a debt to Stranger Things’ demogorgon makes them all the more riveting to behold.